"Mario! Le arance sono finite!!!" So, I can't agree the MG's being at firepower 2 (sorry, just can't, they don't even have the slightest chance of taking out even a Panzer III). So I decided to develop the anti-tank rifle option. Penetration of 18mm at 300m, and hence a 2 to firepower sounds about right. I reserve the 1 to heavy MG's. 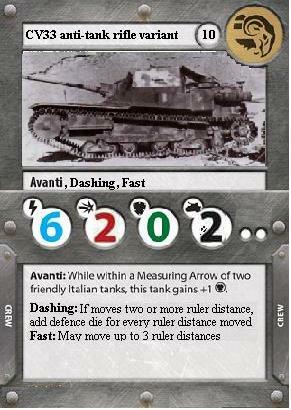 Decided to keep the "Avanti" rule as is from the official developers. Fast I can justify by the fact that it had 42 km/h speed on road, while the T70 - a light and fast tank for comparison, had 47 km/h, however not so best compared to a T34 at 53 km/h. So one may argue against the fast rule, but then again, where is the limit? The Tiger I is not considered slow, but has 22-25 km/h speed, right? Two crew-members, as was in reality, and the two hit points, well, if I do a 1, they become butter on frying pans - like they were, but, then again, lower profile can be used to argue for a higher defence. Points are based off of gut feeling, since the rules of "dashing" have not yet been assigned points values and I would imagine that it cost something, since I basically give the fast moving aggressive player more defence dice. Then again, it should cost more for the Japanese and Soviets, who can combine fire, while not so much for others which do not use cooperative firepower tactics. Something worth considering for future work. So, there you have the pasta of development, feel free to comment and I hope to see some critical remarks on this one. Re: CV33 for GF9 Tanks! Do you mean that it does not exist in the market, or you can't see it within my post? I can see the card, maybe it wasn't loading 100% earlier? I'm not sure I'm convinced on MG being 2 either, depends a good deal on what MG we're talking about and if we're using the same scale for the battle fields. a 3' by 3' table means generally all of our tanks are 100 yards or less vs a relative scale that we're looking at a more abstract field of play. From a quick search a .50 is going to be similar to a 20mm cannon at that range. I think the biggest argument I read for minimum of attack 2 is that its so pathetic as it is, that for game play purposes you give it a pity point. Whether even a .30 is worth that I would lean no, but for fair fun play, maybe. I love it! Once again my friend, Brilliant job with the research and the card! This is getting added to my playlist for testing, both this variant and then only 1 attack to see if anything can ever score a hit. I really want my tiny tankettes for Anzio to be of SOME use besides laying out smoke screens and acting as observers for arty strikes. There's always that one in the million shot that takes out a track or hits a fuel line, or travels through a hole punched in by a bigger gun and rattles around inside. Tankettes are not weak, no, they are strong! With enough enthusiasm (and pasta) they can conquer any foe. Whoops hit the sauce a bit too hard..... That marinara is strong stuff. I really do appreciate the work that goes into all these fan cards, especially with ones that most likely will never make official release. What makes these so fun is they add a *twist* that most likely official cards will not ever have, like the dashing ability. You could have just a generic tank properly statted and it looks nice on the table driving around, but having those extra flairs brings more options for fun. Kind of addressing your other post now, I don't think any of these would be effort lost in vain, there are so many variants in the tanks and different crews that even if official cards come out, any thing we all make here still has a life and use. It's not like there's a huge tournament scene that you have a lot of diehards fighting tooth and nail to exclude fan cards (at least yet ). Anyways, way past the time I should be typing, cheers and thank you again for sharing! Tankettes are not weak, no, they are strong! With enough enthusiasm (and pasta) they can conquer any foe. Now that sounds properly, just like Duce Anchovy! I don't think any of these would be effort lost in vain, there are so many variants in the tanks and different crews that even if official cards come out, any thing we all make here still has a life and use. It's not like there's a huge tournament scene that you have a lot of diehards fighting tooth and nail to exclude fan cards (at least yet ). Yeah, thanks for that, agreed and point taken. Especially if we work towards small and unusual things, most likely they will never appear, and even then, Tanks! is not a game for tournament play like FoW. Cheers for the thumbs up there. Well, then to new horizons. New developments coming your way soon... and as again, not sure what I will be doing, I am purposely holding off developing flamer tanks to see how you go about it. Even though I posted an idea in my last post, still, that is my approach, I always prefer to see if someone comes up with something better, or even just another variant which works just as well. All the best and have a great week! Point taken about MG's, cheers for the explanation - yes they do effectively become 20mm cal. autoguns, which may have a lucky shot, and yes 2 firepower is damn bad if I think about it, especially if you are forced to move fast (3 turns or around that) to survive. I've just been lurking on so many forums that I soak in and steal a lot of other peoples ideas, I try to credit as much as I can and blatantly sprout out the rest! I had forgotten about the flame trailer for the CV33, guess I should try working something out in more detail soon, was just drooling over a Sherman Crocodile that I just learned existed too. I love your idea for crits and will be stealing that for sure. The biggies on my research pile are figuring out just how dangerous a flamethrower is to a tank to estimate damage and check ranges. A Churchill could cover the entire 100 yard board no problem but a lot of other ones did not have that range. But for gameplay mechanic, having just one or two movement arrow range means you have to get in close and dirty which seems more fitting. Besides as many real-life statistics I can find, I'll be comparing it to the rules from FoW 3rd ed with their stats as well. Can do some comparisons regarding what they think attack values would be like on armor. Thanks again, this time for the motivation to keep pushing along, looking forward to what strikes your fancy next! The biggies on my research pile are figuring out just how dangerous a flamethrower is to a tank to estimate damage and check ranges. Not to you about that sentence: depending how accurate you would want to go. German petrol tanks, similar to the Americans, burned like candles from flames. German panzers could be taken out even by partizans with molotov cocktails. Soviets who used Diesel were not as bad with being torched. But, I guess that could be generalized out to avoid over-complicating. So just a note to you when you do the research, you may come up against some discrepancies, take note of what type of fuel the tanks/nations in question used. That should give you some pointers there I hope, good luck, would be interested to discuss when you dig something up, have some stuff from my side too on this matter (buried there somewhere in my pile of stuff on the table). I should credit, that my suggestion for flamers came from a hybrid with a system that unfortunately can't remember together with flame damage rules for Wings of Glory WWI. Designing wargames taught me not to invent the wheel but recycle ideas where they are fit, the key is knowing where they will fit and what their boundaries are - just like what Engineering degree taught me when approaching any problem. I was referring to the post but it seems to have appeared noe.